KORG Gadget, thanks to its variety, sounds and features, embodies the concept of ‘instant gratification tool’ probably like no others. When KORG released Gadget at the beginning of the year, I was tempted to get it, but decided to wait for a proper test. Indeed the app looked very promising but at the same time, its release seemed slightly rushed. Some important features were missing, and given what happened with previous KORG apps, I felt sure Gadget would have received some relevant updates soon. It turns out I was right. Gadget, now at version 1.1, seems to have reached full maturity, thanks to the latest updates. In short, KORG Gadget is a collection of 15 different synthesizers and drum machines. Each Gadget (named after a famous city) is highly focused towards a specific purpose and sound-world. Your song needs an acid bass? Try Chicago, a metal looking bass machine (that comes with a handy arpeggiator). Looking for a warm, polyphonic texture? Here’s Phoenix, great for pads and more mellow sounds. Some sparkling bell sounds? Chiangmai is what you need (I love this one – it may seem like a one trick pony, but it’s just brilliant). Some beats? London is a PCM-based drum-machine with more than 400 samples, flexible and powerful yet simple. I’ll let you discover the other Gadgets, but you get the idea. Some more advanced users may complain about the lack of modulation options and other sound-mangling features, but I think the name of the app is quite self-explanatory. These are brilliant and clever “sound gadgets”, that don’t mean to replicate the functions of complex instruments. That said, don’t think of Gadget as a toy. This is truly an all in one music production tool (minus audio recording), that could keep you busy for weeks. Its sequencer features scenes & clips, and each clip is represented with a piano roll view, quite intuitive even for less experienced musicians. It’s not a full-featured sequencer, but it does the job and it’s pretty fast to use, as you would expect from a mobile app. Automating multiple parameters is pretty straightforward and can make your tracks sound much less predictable. The lack of an Undo in the sequencer (especially when dealing with a complex automation) is rather frustrating though, I hope it gets addressed soon. The Function button gives you access to some useful tools (copy scenes/clips, change the number of bars in a scene, delete notes and automation data, etc.). You can also freeze tracks, which can be handy if your iPad is starting to get old and you are using several instruments in your song. WARNING: Gadget doesn’t have an auto-save function (unlike most other apps I can think of). Make sure to save your song before loading a different one or creating a new one. KORG defines Gadget as an “ideal choice as a second DAW”, and after a few hours with it I can see why. It’s ridiculously easy to come up with ideas and song structures that you’ll almost be tempted to ditch your main workstation. At some point though, to perfect those Gadget tracks you’ll feel the need to export them to your main DAW (especially if you have some high-quality plug-ins and/or analog outboard). One of the features added in the latest updates helps you bring your work from Gadget to your desktop DAW in (almost) no time: you can easily export your tracks to use them as audio tracks in Logic, Cubase, etc. If you’re an Ableton Live user you’re even luckier, since you can now export your project in the Ableton Live format (via iTunes or Dropbox). The phrases of each track and scene in Gadget are converted into audio files (you can choose between WAV and AAC). Audiocopy and Audiobus are also supported, and the 1.03 update added (at last) the possibility of controlling Gadget parameters through your MIDI controller. Last but not least, (as if 15 weren’t enough) now you can also buy two extra Gadgets ($8.99 each as In-App Purchases), a sample player and a loop slicer, Bilbao and Abu Dhabi. The latter looks especially interesting and we’ll cover them in one of our next articles. 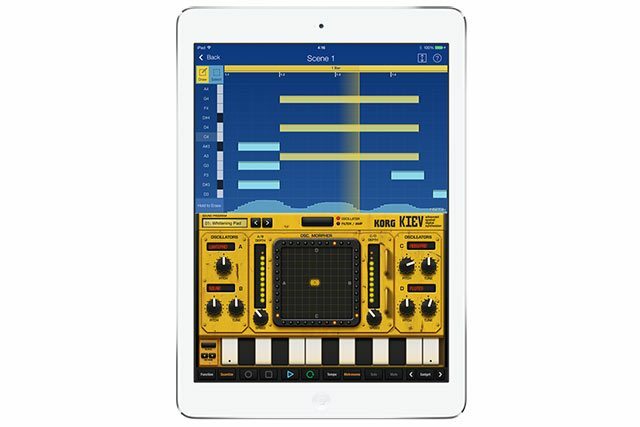 UPDATE: just as I was going to publish this article, KORG added a new In-App Purchase, a 5 instruments-in-1 add-on. 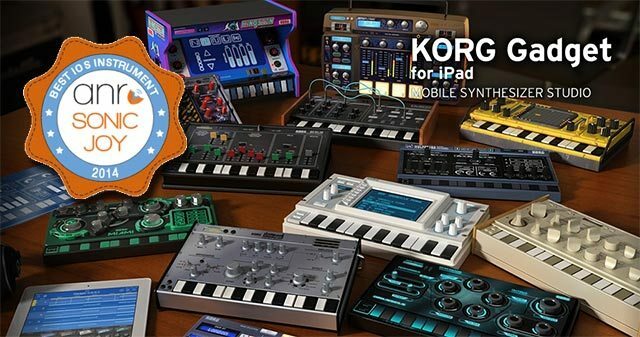 These gadgets are taken from the newly released KORG Module app. More on this soon (here’s our KORG Module review). KORG Gadget, thanks to its variety, sounds and features, embodies the concept of ‘instant gratification tool’ probably like no other. Its price ($39.99) may look steep, but this is no average app (and to put things into perspective, if you’re a desktop DAW user, you know that a single synth plug-in can cost you four times that price!). KORG Gadget is a complete music production tool that proves to be inspiring and fun to use (aren’t these the most important qualities of a musical instrument, after all?). It may not be suitable for all kinds of music – it doesn’t try to replace GarageBand or full-fledged DAWs (you can’t record audio, for one) – but if you are into electronic music and you can’t come up with some good ideas with it, well, you better quit making music and go on a trip around the world (or some other life-changing experience). Could it still be improved? Definitely. Despite these shortcomings, Gadget is one of the best apps of the year, an amazing piece of software that makes me happy and inspired. I wholeheartedly recommend it.